Do ‘kids these days’ even know who Buffy is? The original series finished in about 2003, which is somehow 15 years ago…. Where does the time go? I digress… Upper Deck, the creative minds behind the ‘Legendary’ deck building games clearly feel that people will either be filled with nostalgia at the thought of more Buffy or that ‘kids these days’ do in fact know who Buffy the Vampire Slayer is, because they’re back with Legendary: Buffy The Vampire Slayer! I will admit that whilst I’ve seen a few Buffy episodes here and there, I don’t really know the franchise all that well, but this game focuses specifically on the TV series, and not the comics. 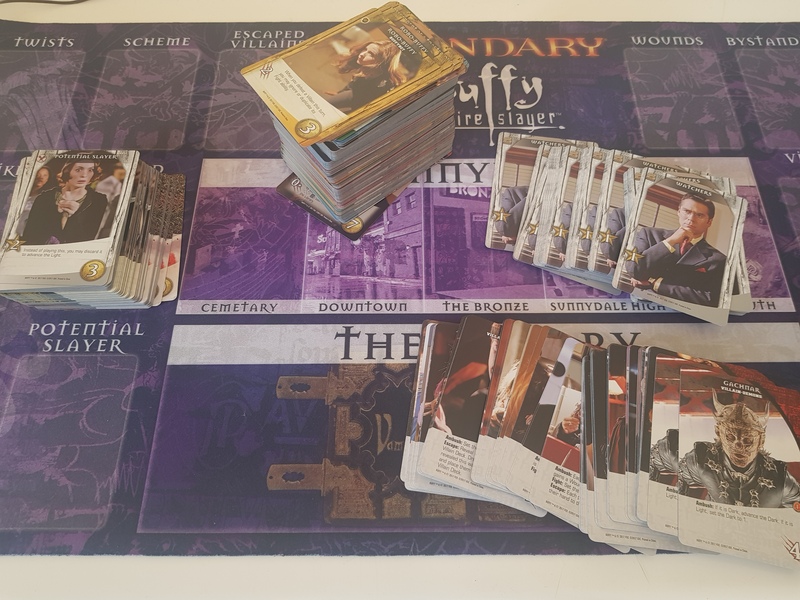 Legendary is a semi co-operative deck building game for up to 5 players (there is also a solo variant), and in this iteration, packed with 500 cards, players will take on the roles of the shows heroes like Buffy, Willow and Giles to try and beat the Big Bad and their schemes. As you might expect over the course of the game you’ll be recruiting heroes in order to fight against villains and eventually try to put a stop to the Big Bads evil scheme. The players will win in the Big Bad is beaten a certain number of times and will lose if the Big Bad is able to finish their scheme. For the most part the game works like most other deck building games I, and probably you have played. You start by selecting heroes, villains, a Big Bad and a scheme for them to follow, depending on how many people are playing will change the number of cards that get used. Then you’ll get it all arranged nicely on the large game mat – which looks great and feels pretty robust too. One new thing to the Legendary series for this game is the addition of the Light and Dark track. At the start of the game, the light/dark token is placed the first dark space on the darkness counter. Throughout the game certain actions and events will move this token up and down track – in to light or further in to dark. This can have both positive and negative effects on the game depending on where the token is on the track. Early on it may feel like you’re up against it a bit, but that’s generally because you have a pretty rubbish deck to start with. But the more you play the better your deck will become and the balance of things will start to sway to your advantage. 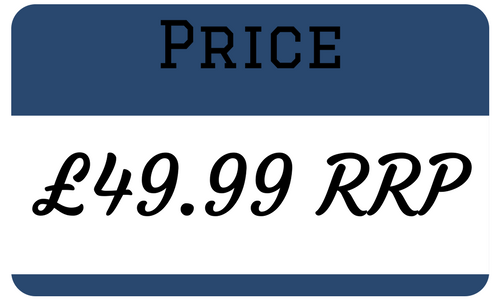 For the most part the rule book is clear and easy to read and after a couple of rounds you probably won’t really need to be referring back to it for any reason – a good sign for sure! Everything feels really good quality throughout the box, the cards feel very sturdy, although I do find some of the art work on them quite funny but that’s mostly because they’re stills taken from the shows and look pretty retro 90’s. Everything all fits in nicely in the box too – something that I very much appreciate and the inclusion of the dividers for each of the sets of cards with space to write on them is a bit of a god send, I can imagine it being a nightmare without it… I’m guessing all other Legendary games have this though? Overall Legendary: Buffy The Vampire Slayer is a nice trip down memory lane with some good solid deck building gameplay, but I never really felt that excited by it, it wasn’t a bad experience at all – I think it’s a solid game and generally I enjoy deck building games, but I just don’t really feel like it’s something I, or my group would want to play over and over and I’m not sure if that was because of the theme or not. Maybe if you’re more of a Buffy fan then you’d like it more, I feel like that hit of nostalgia might engage people a little more. Even so, if you’re just a big fan of deck building games, then I still think you’ll find a lot of enjoyment from Buffy and a hell of a lot of replay-ability too. My sister is hugely into Buffy, and I very much like Legendary. So I reckon I’ll pick this up for her to play during family get togethers! Oh man, had the biggest crush on Buffy back in the day. Probably not too interested in the game but man did I just have one hell of a nostalgia trip.